Hormel Foods Corporation (NYSE: HRL) today reported its performance for the fiscal year 2013 third quarter. All comparisons are to the third quarter or first nine months of fiscal 2012. The company reported fiscal 2013 third quarter net earnings of $113.6 million, up 2 percent from net earnings of $111.2 million a year earlier. For the nine months ended July 28, 2013, net earnings were $368.9 million, as compared to net earnings of $367.4 million the same period last year. Diluted net earnings per share for the nine months ended July 28, 2013 were $1.37, equal to a year ago. Sales for the quarter were $2.2 billion, up 8 percent from the same period in fiscal 2012. For the nine months ended July 28, 2013, sales totaled $6.4 billion, up 6 percent from the same period last year. “Our Grocery Products segment benefitted from good performance by our new SKIPPY® business. Our Jennie-O Turkey Store segment delivered a strong quarter, despite higher grain costs and lower commodity meat prices. Our International business continues to achieve impressive results, led by strong export sales of our SPAM® family of products and fresh pork, as well as the addition of the SKIPPY® business. Higher pork input costs squeezed margins for our retail value-added products, particularly bacon, decreasing our Refrigerated Foods segment results during the quarter,” Ettinger remarked. 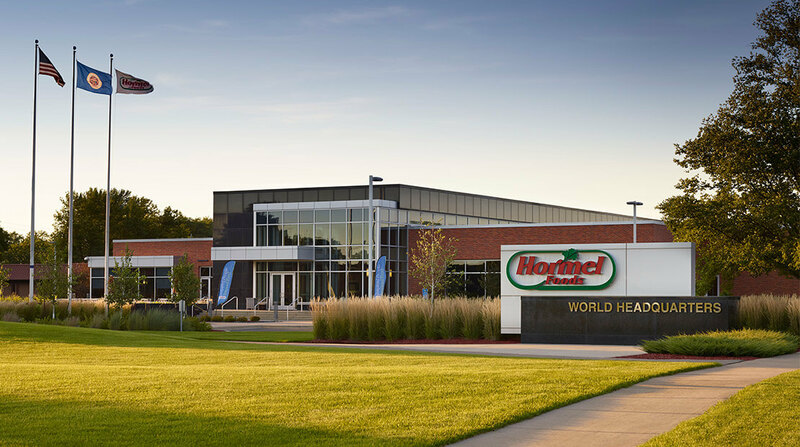 “We are excited about the recent roll-out of our HORMEL® REV® snack wraps during the quarter, which is supported by a national advertising campaign that began in late July. I am also pleased with the progress our team has made in integrating and growing sales of SKIPPY® products, both in the U.S. and internationally,” commented Ettinger. Grocery Products segment profit increased by 32 percent. Net sales, including SKIPPY® products, increased over last year’s results by 25 percent. Excluding SKIPPY® products, segment sales were flat as compared to last year. Net sales of DINTY MOORE® stew, HORMEL® MARY KITCHEN® hash, and HORMEL® bacon toppings increased over last year. Refrigerated Foods segment profit declined 26 percent, as elevated raw material costs squeezed margins in certain retail categories, with bacon impacted the most. Sales increased 2 percent, led by retail sales of HORMEL® party trays, HORMEL® NATURAL CHOICE® deli meats, and HORMEL® CURE 81® hams, and foodservice sales of HORMEL® FIRE BRAISED meats and HORMEL® PECANWOOD bacon. Jennie-O Turkey Store delivered a solid performance this quarter despite high feed costs, with segment operating profit up 17 percent from a year ago. Increased value-added sales and an improved product mix offset higher feed costs and lower commodity meat prices. Net sales for the quarter rose 4 percent, driven by growth in sales of JENNIE-O TURKEY STORE® ground turkey chubs and turkey bacon. Specialty Foods segment profit increased 8 percent and net sales grew 5 percent, led by sales of sweetener, nutritional products, ready to drink beverages, and ingredients. The agreement allowing Diamond Crystal Brands to sell SPLENDA® sweetener into foodservice trade channels was extended one month to July 31, 2013. The International & Other segment grew segment profit by 34 percent and net sales by 31 percent, driven principally by stronger exports of our SPAM® family of products and fresh pork, improved performance by our operations in China, and the addition of the SKIPPY® export business. Effective August 15, 2013, the Company paid its 340th consecutive quarterly dividend, at the annual rate of $.68. A conference call will be Webcast at 8:00 a.m. CT (9:00 a.m. ET) on Thursday, August 22, 2013. Access is available at https://www.hormelfoods.com. If you do not have Internet access and want to listen to the call over the phone, the dial in number is 877-941-8609 and you must provide the access code of 4632577. An audio replay is available by calling 800-406-7325 and entering access code 4632577. The audio replay will be available beginning at 10:30 a.m. CT on Thursday, August 22, 2013, through 11:59 p.m. CT on Thursday, September 5, 2013. The Webcast replay will be available at 10:30 a.m. CT, Thursday, August 22, 2013, and archived for one year. Hormel Foods Corporation Declares Quarterly Dividend Hormel Foods authorized its quarterly dividend on the common stock at seventeen cents (17¢) a share. Hormel Lowers Outlook for Fiscal 2013 Hormel Foods lowered its full year guidance range for fiscal 2013 from $1.93 – $2.03 per share to $1.88 – $1.96 per share.